SINGAPORE - Supermarkets and other retailers may be required to report the amount of plastic bags they use, and plans to reduce their usage, by 2021. Dr Amy Khor, Senior Minister of State for the Environment and Water Resources announced this on World Environment Day on Tuesday (June 5) at the launch of the United Nations (UN) Environment's #BeatPlasticPollution Campaign. This move is in line with previously announced plans by the National Environment Agency (NEA) to make it mandatory by 2021 for businesses to report on their packaging waste and their waste reduction plans. On Tuesday, a 120m caterpillar made from discarded plastic bottles was unveiled at Marina Barrage to raise awareness about plastic pollution. The art installation will be on display for a month, during which time more plastic bottles decorated to look like flowers will be added to its body by volunteers from schools, businesses and government agencies. The artwork, which will be made up of 18,000 bottles in total, will then be broken up and displayed in schools as smaller art installations. 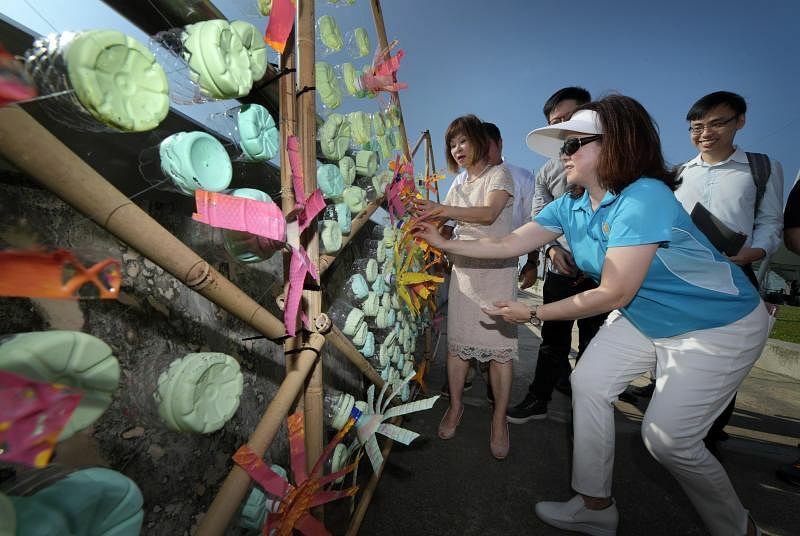 Two other art installations at City Square Mall and South Beach Avenue, along with recycled plastic installations located in 11 other Asia-Pacific cities, will also aim to raise awareness about plastic pollution. Dr Khor reiterated the need to tackle excessive consumption of disposable plastic, pointing to how disposable utensils will not be allowed in new hawker centres here for dine-in usage. "The manufacturing of more plastics, and the stagnating recycling rate have exacerbated climate change," Dr Khor said. Figures released by the NEA show that the rate of plastic recycling fell last year, even as the amount of plastic waste generated has decreased. Some 815,200 tonnes of plastic waste were generated last year, down from 822,200 tonnes in 2016. But less than 6 per cent of plastic waste was recycled in 2017, compared to 7 per cent in 2016. Governments around the world have acted to reduce the amount of plastic waste in recent years. The United Kingdom has pledged to eradicate avoidable plastic waste by 2042 and is considering banning plastic straws. Malaysia's new Pakatan Harapan government is considering banning the use of plastic bags in a year's time. Dr Isabelle Louis, UN Environment Deputy Regional Director and Representative for Asia and the Pacific, said South-east Asian countries, including Singapore, have not done enough to tackle plastic pollution. She stressed the importance of legislative solutions, such as banning single-use plastic, but added that such restrictions must come with measures by governments and businesses to promote sustainability efforts. "There is also a need to give more incentives to the private sector to bring in alternatives... such as reducing tax imposition, encouraging innovation and laws that ensure better enforcement (of environmental laws)," she said. Some countries, said Dr Louis, remain hesitant about introducing bans because of concerns about a lack of alternatives and negative economic consequences. In such cases, companies can provide alternatives and solutions.